You know something I've noticed? 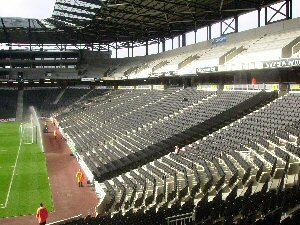 When a new stadium is built these days the seats aren't the colour that the team wear. 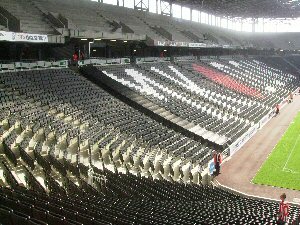 Darlington build a stadium with red seats but play in black and white, Rushden also built one with red seats despite their home kit at the time being white, and now MK Dons have built a black seated stadium to match their white kit. However, this stadium is better than all the recent build stadiums that I've visited. Although it doesn't look impressive from the outside because it has yet to be completed, once inside it is arguably the best stadium in terms of quality outside of the Premiership. Walking into the stadium you can automatically see the quality and the money that has been spent on the ground. With fantastic facilities and seats that are easily the most comfortable outside the Premiership, this stadium is money well spent. The away end is kind of in an awkward position, being situated in the corner of the ground, and due to the size of the pitch it is kind of difficult to see what is happening down the other end. However, the view of the rest of the action is quite good. With the seating on a corner, you can choose to either sit behind the line, or level with it, this is unique choice in the lower leagues. 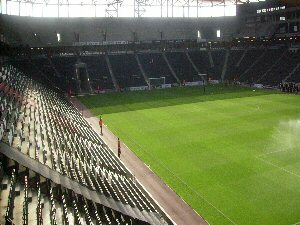 The stadium continues with plain black seats all the way around, with only the words "MK Dons" and a red dot providing the only different colours. There are two things that let this stadium down though. The first is that there's virtually nothing to do outside of the stadium, unless you want to go shopping in Asda or idea that is. 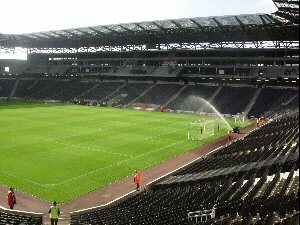 The other is a lack of atmosphere, something that was virtually none existant on the visit, with only the occasion "MK Army" chant coming up. However, other than these two factors it is a brilliant stadium and a very good day out.